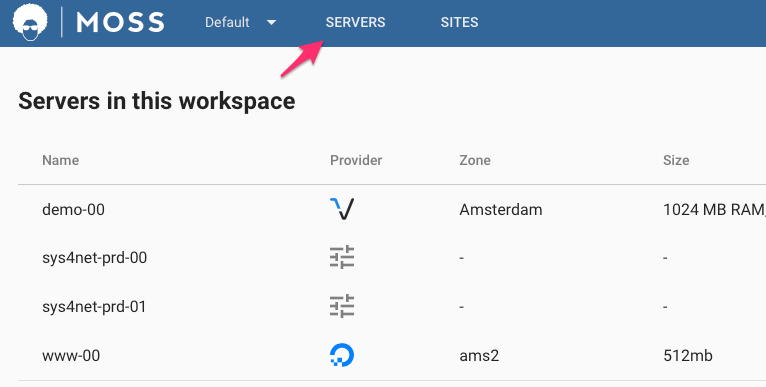 You can always head to the list of servers in a workspace by clicking the 'Servers' button. From Moss you can manage each of your servers. If your plan allows it, you can check resource usage metrics for cpu, memory, filesystem and i-nodes. In addition, you can manage the SSH keys bound to the server, the databases it contains, and some of the software it runs. Move your server to a different workspace, e.g. when you want to provide another team with access to your server. Note that existing SSH keys on the server are still there, so if you don't want the users of the current workspace to log into the server any more, remember to delete them. Unbind your server from Moss. This tells Moss to stop managing your server. It'll keep running as usual, but you'll have to manage your server by any other means. Provision your server. This tells Moss to set up your server, just like he did the first time you added your server to Moss. Take into account that this action may upgrade any software package currently installed on the server. Usually you won't need to re-provision your servers, unless we somehow improve the configurations that Moss applies and you want to benefit from such update. If you launched your server on your own and connected it with Moss later on, the latter are the only three actions you can perform on the server. In case Moss launched your server on any of the providers it natively supports (Amazon, DigitalOcean, Google, Vultr), you can also start, stop, reboot, and terminate your server from Moss (not all actions are available in all providers). Note that terminating a server implies that it's fully destroyed, so please make sure that's what you really want. Now you have an idea of how your servers can be managed with Moss, let's take a look to the other key resource in Moss: Sites.